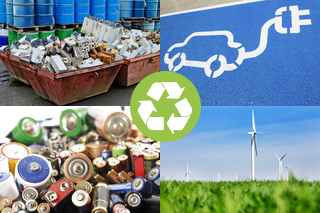 The REE4EU project has demonstrated at a pilot scale a closed-loop permanent magnet recycling process for the first time in Europe. The REE4EU pilot has successfully treated several tons of in-process wastes and end-of-life products containing rare earth elements, resulting in the recovery of almost hundred kilos of rare earth alloys directly from the mixed rare earth oxides feedstock produced. The alloy will be reused in the manufacturing of permanent magnet products. Take a look at the video showing the REE4EU pilot plant in operation! LCM has carried out trials in the 1KA electrolysis cell to convert permanent magnets-derived Rare Earth Oxide (REO) supplied by VAC to validate the REE4EU High Temperature Electrolysis (HTE) technology. SINTEF participated in the trials and carried out off –gas analysis to assist in process understanding and reducing gas emissions. The ingot produced was converted to strip cast alloy and supplied to VAC to produce permanent magnet. In the video below, the Rare Earth Alloys (REA) production in the HTE cell at LCM is shown. REE4EU: integrated high temperature electrolysis (HTE) and Ion Liquid Extraction (ILE) for a strong and independent European Rare Earth Elements Supply Chain. The project, funded in the frame of Horizon 2020 TOPIC SPIRE-07-2015, will realize a breakthrough innovation in the field of Recovery Technologies for Metals and other Minerals. It will make available Rare Earth elements and Rare Earth alloys for magnet production by developing, for the first time at industrial scale, an efficient and cost effective method of extraction and a direct production route for Rare Earth Alloys which will be achieved through in-process and End-of-Life permanent magnets as well as Ni metal hydride battery waste.